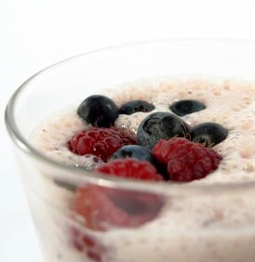 Raspberry-Blueberry Smoothies - A recipe from Savor California, the online showcase for extraordinary gourmet foods and beverages from California. Smoothies make a great protein fix for the day. Use bendable silicone muffin cups to freeze the liquid into single portions for the freezer. Turn them into an instant smoothie on your way out the door in the morning. Place all ingredients into a blender container in the order listed. Blend until smooth, about 30 seconds. Divide among 12 medium-sized muffin cups and freeze until solid about 4 hours. Unmold smoothie cups and place in a zip-top bag for storage in the freezer. If you have trouble unmolding the frozen cups, try placing the bottom of the muffin tray in warm water for several seconds, being careful not to thaw the contents. When ready to serve, place 1 cup liquid of choice (such as sugar-free cranberry juice) and two smoothie cups into a blender; blend until smooth. If your blender bogs down, cut the frozen cups into quarters. Add additional liquid as needed. Serve topped with grated chocolate or fresh berries.